Here you’ll find travel reports about Bangkok Yai. 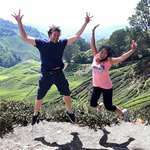 Discover travel destinations in Thailand of travelers writing a travel blog on FindPenguins. Day 1: Flight from Brussels to Bangkok with Thai airways.